Fish and chips have long been a popular takeaway meal in New Zealand. Food historians have not been able to pinpoint exactly when the meal became an established part of New Zealand cuisine but all recognise it came to New Zealand with British settlers in the 19th century. 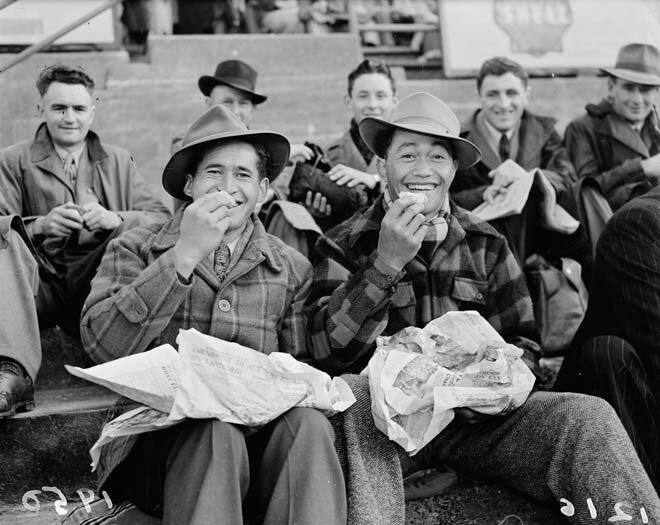 These men are enjoying fish and chips wrapped in newspaper before a rugby game between the British and Māori rugby teams at Athletic Park in Wellington, in 1950.